In the early 1700’s the region of Tibet as as well as Turkestan (as Xinjiang used to be called at that time) come under the control of the Chinese Imperial Qing Dynasty as they defeated the Dzungar Mongols who had come to occupy Tibet. As a result of this the Qing Dynasty was now in control of Tibet and in order to exercise this control the appointed an Officer called the Amban to overlook the running of the state and especially keep his eyes and ears open for ambitions that a foreign nation / power might have on Tibet. For the same purpose the Ambans and their network of informers and spies were always taking stock of various Traders who visited Tibet and Lhasa and soon after the Qing assumed dominance they imposed restrictions on many Traders coming from Nations that were assumed to be a threat to the Qing control over Tibet. And this was most severely applied to Europeans who the Qing saw as the most obvious threat. And then there were the Russians who were also expanding their Empire towards the East. The Europeans were restricted to trade only through Canton (Hong Kong) while traders from Russia could only come through the trading Post at Kyakhta. While impositions were imposed on almost all outsiders, there were three Groups of traders that were allowed relatively freer access to Lhasa. These were the Newaris of the Kathmandu Valley, the Andijanis of the Ferghana Valley and the Kashmiris. For some reason these three Groups of people were left alone to their own devices. One of the reasons was that these people had been trading with Tibet for hundreds of years and many of them had even settled there. And they connected the region with the important markets in the Indian subcontinent in case of the Newaris and the Kashmiris and to Central Asia vai the Andijanis. An important consideration for the Qing was that as per their own assessment all these traders came from Countries / Regions that were not a threat to their sovereignty over Tibet. Towards the end of the 18th Century however the Qing perceptions begin to change. The Gurkhas attacked Tibet twice and though peace was restored after the intervention of the Qing, the Qing were now suspicious of the Newaris as they couldn't really distinguish between them and the Gurkhas as both were from Nepal, though the Gurkhas had taken the Kathmandu Valley from the Newari Rulers. And in the beginning of the 19th Century the Afaqi Khojas revolted in Turkestan and for some time they held the main cities of the Tarim Basin and they lost their confidence in the Andijanis of Ferghana as well. Through it all one community which kept up its “neutrality” in the eyes of the Qing were the Kashmiris. The Kashmiris were known as Kachee by the Tibetan and Kashmir was called Kachee Yul. Infact the term Kachee came to be used for all Muslims in Tibet irrespective of where they came from. Kashmiri traders and craftsmen had been visiting Tibet since the 10th Century as many Kashmiri craftsmen were bought in to decorate the Monasteries as Buddhism grew in Kashmir and the Kashmiris were supposed to be the best at this trade. As a result Tibetan art shows even till day a great Kashmiri influence. Also as a result many Kashmiris settled in Tibet and took Tibetan wives and intermixed with the local populations. Now as far the Qing and their Ambans were concerned they knew of the Kashmiris and their long standing Trade relations with the Kashmiris. But one thing they weren't sure was about the location of Kashmir. They knew it was a Region to the West of the Tibetan plateau but that was about it. They had no idea about the Political affiliations of Kashmir or of the Kashmiri people. And the Kashmiri people were seen as outsiders who usually minded their own business with little interest in the Politics of Tibet or of the Qing. And they were good Traders who did a large volume of business in Lhasa. And the point to be noted is that most Kashmiris used to visit Lhasa through Patna and Nepal instead of of the Route over the Himalayas. The fact that Kashmiris had easy access to Tibet did not go unnoticed to the British. The British for long held ambitions on getting through to Tibet as it was uncharted territory to the North of the their greatest possession. Also there was a constant fear of Imperial Russia gaining influence in Tibet. Many British and Western explorers had wanted to break into this Forbidden Land but were not very successful. So the British had to fall upon its native subjects to do their bidding in Tibet. In the wake of the Anglo Gurkha War of 1814 and the British Victory, the British came to be in possession of Garhwal and gained direct access to Tibet from there but the British were always turned back at the frontier by the Tibetans who themselves were wary of any unknown foreigners. It was around this time that an enterprising Kashmiri trader, Ahmed Ali offered his services to the British. Ahmed ali presented himself as a well connected Kashmiri who had a relatives who lived in Lhasa and had travelled to Lhasa many times on his own. The British were very interested in this guy and the key to Tibet that he might hold. But they could not give him any Official sanction as they wanted to exercise plausible deniability in case Ahmed Ali was caught. The point was that the Qing had not realised the the same guys they were having a tough time with in Canton were now sending spies into Tibet. As far as the Qing were concerned the “Pilangi” as they called them (Tibetan / Chinese version of Firangi as they were referred to in India) and the Britishers in Canton were two distinct people from different Countries. And the British of course didn't want this little secret revealed to the Qing. All said and done Ahmed Ali proposed that he also be made the agent for trading Indian goods in Tibet on behalf of the British. And of course the British would not give him any legal standing. As it so happened Ahmed Ali himself was no old Tibetan hand. He spoke no Tibetan and in fact his business in Tibet was taken care of by an old Kashmiri employee Abdullah and he was also joined by Ahmed’s brother. However the business didn't go as well as proposed though all the time Ahmed was collecting information through his guys in Tibet. In 1827 Ahmed was called to Tibet by his brother and Abdullah to settle the losses they had incurred. Ahmed Ali had no option but to go to Lhasa as his brother insisted on the same. He went to Lhasa and due to the losses he had a falling out with his brother and Abdullah and the matter was brought to the notice of the local authorities. Somehow the matter was settled but now Ahmed Ali had no one to handle his operations in Lhasa. Another old Tibetan Kashmiri suggested that he take the services of his brother Fazlullah Fakroo, another Tibetan Kashmiri. And again his enterprise started. However his affairs with his brother and Abdullah were not settled. His brother sued him for his share of family property back home and the case was taken to Court and representing Ahmed Ali in his absence was his new employee Fazlullah. Through all his business troubles Ahmed Ali kept on compiling information on Tibet through Abdullah and his brother when things were good and later on through Fazlullah. He had considerable information on hand gleaned through various sources including Route maps and distances and also the Political situations in the different towns and Villages. Just that he was good Spy but no so good a Businessman. Anyways there was no end to his financial woes as the Court ruled in the favour of his brother and Abdullah and now the Spy was bankrupt as well. So he bade his time by hanging around the Mosque in Lhasa. And as ill luck would have it he had a falling out with Fazlullah who he accused of causing great losses in business and filed a case against him. On the Court disposition Fazlullah first made a suggestion to the Court about the suspicious activity that Ahmed Ali was indulging in. About all the questions he always kept on asking and noting them down. The Court brought this to the notice of the Amban and now everyone was interested in the Spy. As a result the Spy was son picked up by the Qing authorities and all his papers and notes were confiscated and he hauled up for interrogation. Now the thing was Ahmed Ali did not speak Tibetan or Chinese and all his notes were in Persian and English. So the authorities had to gather a group of people to decipher and translate his papers. Translators were found for Persian and it is said it took them two months to decipher and translate all the notes. The notes contained information about the Routes, Passes and general Topography of Tibet, the strength of Chinese and Tibetan soldiers, the working of the Financial departments, the general dispositions in Sichuan and Gansu and other such information deemed as sensitive. But for the English notes they could not find any any translator. The Spy was caught red handed it seems. The Spy however would not give in so easily. He said he took notes only as per the “custom of his homeland” and he intended to write a book which could be used by other Traders from Kashmir and elsewhere to visit Tibet for trade. He was promoting Trade in Tibet through this. And he swore that not an iota of information had been sent over the Himalayas to any power inimical to the British. The Qing officials of course had a hard time believing his theory and were convinced that he was a Spy. Though who exactly he was spying for was never very clear to them. At the same time Ahmed Ali sent a message to the East India Company asking them for help as he was working for them. He played his Ace. The British were now in a delicate situation as they didnt want Ahmed Ali to put them in the spot and jeopardise their relations with the Qing which would surely have repercussions in their Trading Post in Canton as they were aware that Ahmed Ali would reveal their little secret to the Qing. The British made a secret appeal for help to the powerful Nepali Prime Minister Bhim Sen Thapa to use his good relations with the Tibetan and the Qing to secure the release of the Spy. But they were surprised when they were told by Bhim Sen Thapa that Ahmed Ali had already been released by the authorities and was probably already on his way back. So why did the Qing authorities release Ahmed Ali without any punishment ? Well for one he was expelled from the Country and handed over to the Nepalese authorities with requests to send him over the border to India. It seems that the matter was quite a sensitive one but the Qing didn't really want to undermine the confidence of the Kashmiri traders. As they were the people through which they could still have a lucrative trade with other Regions without compromising on their own strict no foreigner’s Rule. There were also suggestions that Ahmed Ali had agreed to supply some information from the British side to the Tibetan and Qing authorities. Maybe he was just a smart Guy who somehow managed to squeeze out of the situation. What was the exact reason of his release is still shrouded in somewhat of a Mystery and hence we can only now try and and make guesses on the actual circumstances that led to him being just deported instead of being severely punished. Maybe we will never know. Of course even after this incident the British intrigues in the region didn't cease and we saw the Era of the “Pundits”, native men who went to Tibet to carry out surveys for the British including people like Pandit Nain Singh Rawat and others. However whatever happened to Ahmed Ali after his return is unknown. The Kashmiri Spy just vanished from the annals of of the history of Political Intrigue in the History of the Himalayas. 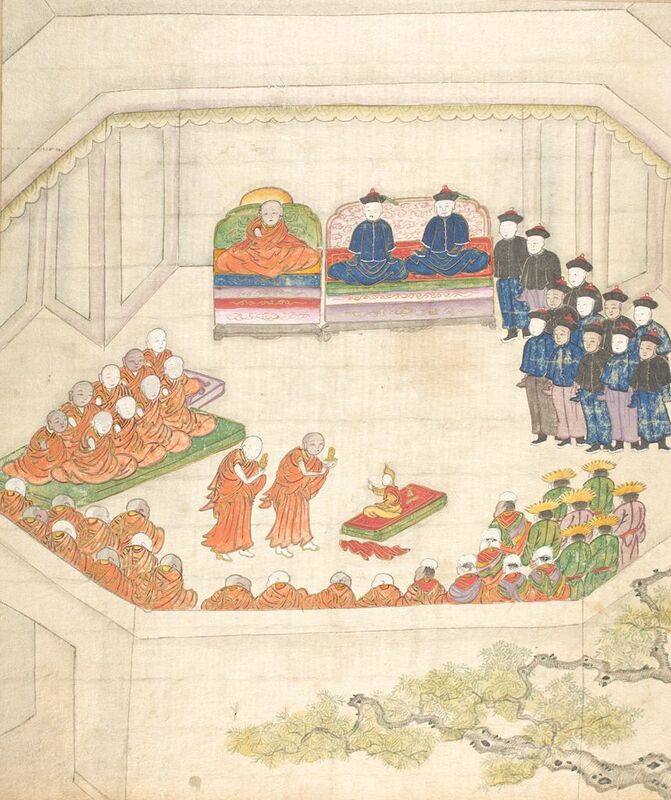 The panting from the Qing Era shows the Induction of the 9th Dalai Lama, Lungtok Gyatso, in 1808 as its watched by the Ambans and Qing officials on one side and by Tibetan Clergy and other Tibetans on the other side.